The George Inn01969 663256work Guest AccommodationThe George Inn is situated in the picturesque village of Thoralby in Bishopdale close to Aysgarth Falls - a hidden oasis in the heart of the dales. 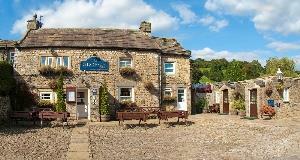 This is an ideal location for exploring the Yorkshire Dales National Park with its many attractions. Close by is Wensleydale, a lush sweeping valley, distinct for its wooded knolls and hidden waterfalls, the most famous being Aysgarth Falls and Hardraw Force.